The former Fleet-McGinley Company building at the northwest corner of Water and South Streets was built in 1908—one of scores of new warehouses and factories built around downtown as the city rebuilt from the Great Baltimore Fire of 1904. The five-story brick and reinforced concrete warehouse was designed by the prominent Baltimore architectural firm of Baldwin & Pennington for the Johns Hopkins Hospital trustees at a cost of $70,000. One of the building's earliest and most prominent tenants was the Fleet-McGinley Printing Company, established in 1884 as a partnership between Charles T. Fleet and J. Edward McGinley. 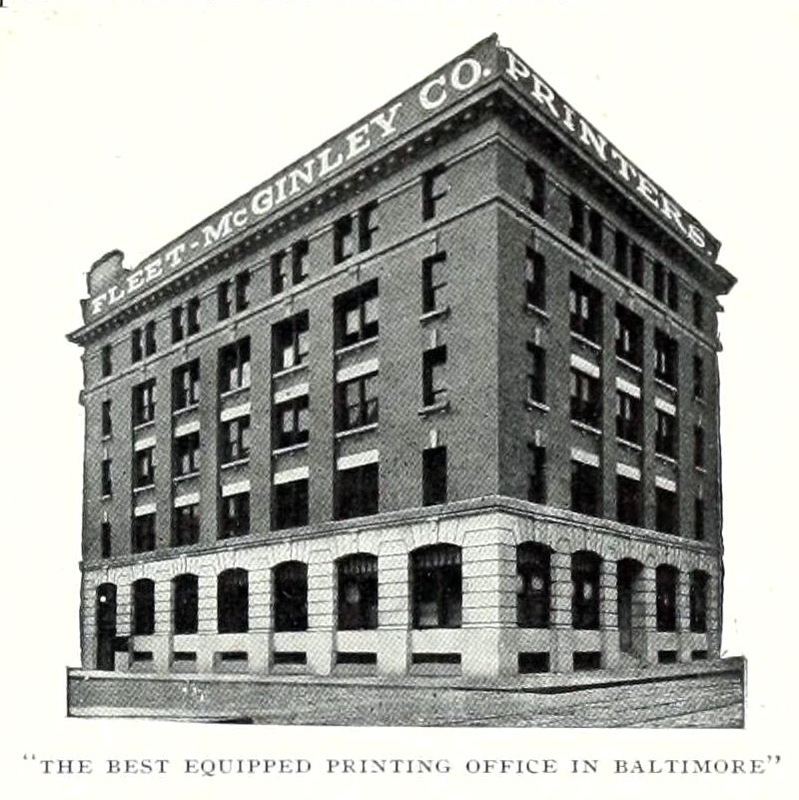 In 1914, Fleet-McGinley boasted that their building was "the best equipped printing office in Baltimore" boasting "the most modern appliances and equipment" along with "skilled and competent artisans." In the aftermath of the recent catastrophe, the printer paid special attention to fire-proofing, describing their "fire-proof vaults for the storage of plates, engravings and designs, which make the destruction by fire of such valuable property practically impossible." In 1926, the Manufacturers' Record, a trade publication printed by the firm since the 1880s, purchased Fleet-McGinley and moved their operations from South Street to the Candler Building on East Lombard Street. In 1965, the business (still located in the Candler Building) was renamed the Blanchard Press of Maryland. The building on South Street later served as offices for insurance agents Hopper, Polk & Purnell, Inc., as well as Levy Sons Company, manufacturer of women's underwear. In early 2015, Goodwill Industries of the Chesapeake purchased the building from the International Youth Foundation who had occupied the structure for over fifteen years. Eli Pousson, “Fleet-McGinley Company Building,” Explore Baltimore Heritage, accessed April 23, 2019, https://explore.baltimoreheritage.org/items/show/435. Published on Feb 16, 2015. Last updated on Nov 27, 2018.